The much awaited sequel to the best selling book, “Formation Attacks”, has arrived. “Formation Attack Strategies” is another 500 page book, full of great attack information with 579 fabulous attack games from all openings and all eras. The games provided in the book came from an in-depth global search for unique, inspirational, and original attacks from some of the world’s greatest attackers. Many of the them toil in remote areas of the planet and have only a local following. Let me introduce you to attacking players like Guy West of New Zealand, Marc Esserman of Boston, MA, Liu Wenzhe of China, Kevin Seidler of Denver, CO, Manuel Bosboom of The Netherlands, Dharshan Kumaran of India, Padre Murphy of Ireland, to name a few. If you are one of the many people who love my last book, you will be ecstatic about “Formation Attack Strategies”. I think I've died and gone to heaven. Joel has a Fishing Pole chapter where I beat GM/s/IMs. also featuring games from many friends like Ted Doykos, Kevin Seidler, GB Salvio ( A Brazilian who plays Fishing Pole blitz and postal games ), Jack Young, Craig Thomson ( Goyathlay ) and many others. It also warms my heart when I see games from Ireland or my games in non-Fishing Pole chapters. 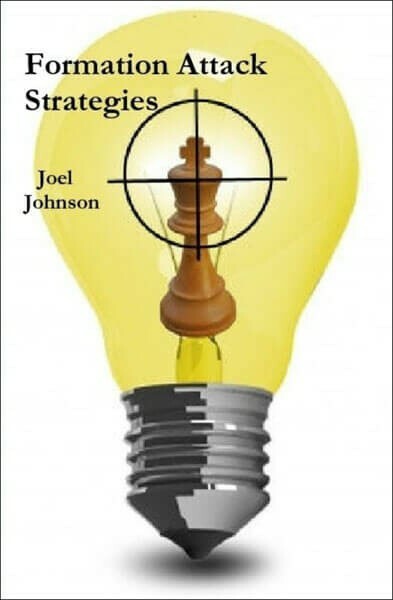 Of course plenty of GM games plus plenty of original attacking theories straight from Joel Johnson's laboratory. As usual the games are arranged by themes with plenty of explanations and examples. This time it's even better because we get fan mail from the first book, Formation Attacks, from around the globe. This book is the easiest to sell I've ever handled. It's terrific to see Joel succeed with another instant classic.